It’s summer and that means it is time to pay extra attention to our skin to prevent damage, brown spots, redness and increased oil. Make sure you are brightening and protecting your skin! These tips are sure to help you to survive this summer! Use an SPF of 30 or 50. Make sure your SPF has zinc oxide, this is the best ingredient use to prevent damage on your skin from UVA/UVB rays. Generous and continuous application is the key. 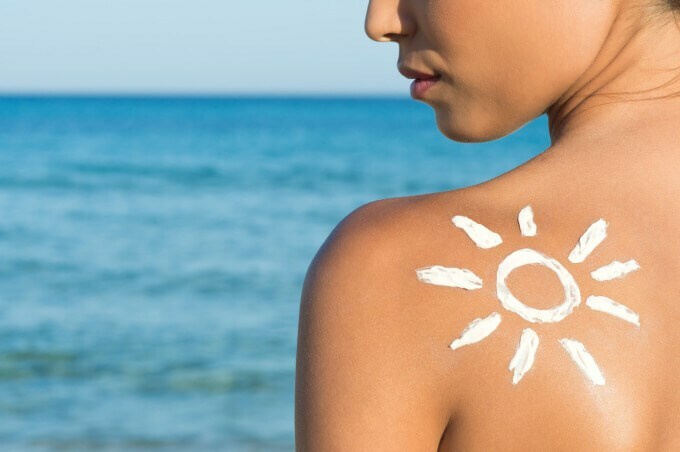 Do not forget to lather SPF on your neck, chest and ears as these areas are an extension of your face!. Always use SPF no matter what. Even indoors, especially when daylight is coming through. Wear SPF year round. Remember, It doesn’t have to be hot to get damage, you can get just as much damage on cooler days. 2. Be sure to give your skin extra water-based hydration since summer heat can evaporate water from the skin. Moisturizer keeps moisture and oil in the skin but consider using extra water-based products to give hydration to the skin like our Skin Medica HA 5 Rejuvenating Hydrator. Remember, drinking more water it is not enough for your skin, so topical hydration is a must. 3. Use topical antioxidants: Get Vitamin C Facials and use Vitamin C products at home. Free radicals contribute to aging (from stress, poor nutrition, oxygen, daylight etc). Use antioxidants topically because they act as a bodyguard for skin cells and fight free radicals. Vitamin C helps to reduce redness, the formation of capillaries and prevents discoloration from heat and sun. Our Osmosis Replenish and Osmosis Catalyst AC 11 are the products to use this summer! Get an antioxidant facial, our Osmosis Pigment Protection Facial is a must treatment for this summer! You will love how your skin looks and feels! 4. Ingesting vitamins helps protect the cells in your body. Eat products rich in lycopene which is found in the red pigment of pink grapefruit, papayas, berries and tomatoes. Fruits and vegetables with color will provide antioxidants. Take a vitamin C supplement (1000mg) twice a day. 5. Limit your time spent out in the heat to prevent capillary damage and sun damage spots. Most of us have brown spots that come out in the summer from not only the sun, but the heat, too. Did you know that studies confirm that heat will trigger melanin cells and create discoloration? Yes, it is true, now we know, so stay out of the heat as much as possible, specially if pigmentation is a big problem for you, avoid working out outside, sauna, hot yoga, etc. Also be aware of heat in the shower, when washing your face. The primary cause of capillary formation are aging and sun damage that cause the skin to become thinner and lose collagen. As collagen is a protein in the body that helps the skin stay firm and elastic, its loss makes the capillaries more vulnerable. There you have it! Be your own bodyguard with these summer survival tips and don't forget to get our amazing Osmosis Pigment Protection Facial this summer!